This is a Korean name; the family name is Bong. 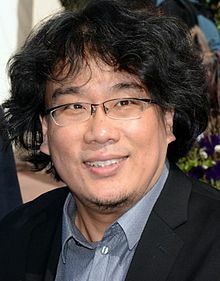 Bong Joon-ho (Hangul: 봉준호, Korean pronunciation: [poːŋ tɕuːnho → poːŋdʑunho]; born September 14, 1969) is a South Korean film director and screenwriter. His films include monster movie The Host (2006) and sci-fi action movie Snowpiercer (2013), both of which are among the highest-grossing films of all time in South Korea. His most recent film, Okja, debuted at the 2017 Cannes Film Festival, where it received a four-minute standing ovation. In 2017, Metacritic ranked Bong #13 on its list of the 25 best film directors of the 21st century. His films feature uncomfortable subject matter, black humor and sudden mood shifts. Bong Joon Ho was born in Daegu in 1969 and decided to become a filmmaker while in middle school. Bong Joon Ho had a highly intellectual upbringing; his father, Bong Sang Gyun, is a graphic designer and his maternal grandfather, Park Tae Won was a noted author, famous for A Day in the Life of Novelist Gubo. His older brother, Joon Soo, is an English literature professor now teaching in Seoul National University, and his older sister, Jee Hee, is a fashion designer. Despite his passion for film, he did not enroll for a theater major in university due to his parent's disagreement. He majored in sociology in Yonsei University in the late 1980s and was a member of the film club there. He was then a fan of Edward Yang, Hou Hsiao-hsien and Shohei Imamura. In the early 1990s, he completed a two-year program at the Korean Academy of Film Arts. While there, he made many 16mm short films. His graduation films Memory Within the Frame and Incoherence were invited to screen at the Vancouver and Hong Kong international film festivals. He also collaborated on several works with his classmates — most notably as cinematographer on the highly acclaimed short 2001 Imagine, directed by his friend Jang Joon-hwan. Aside from cinematography on Hur Jae-young's short A Hat, Bong was also lighting director on an early short Sounds From Heaven and Earth by Choi Equan, and The Love of a Grape Seed. After graduating, he spent the next five years contributing in various capacities to works by other directors. He received a partial screenplay credit on the 1996 omnibus film Seven Reasons Why Beer is Better Than a Lover; both screenplay and assistant director credits on Park Ki-yong's 1997 debut Motel Cactus; and is one of four writers (along with Jang Joon-hwan) credited for the screenplay of Phantom the Submarine (1999). Shortly afterwards Bong began shooting his first feature Barking Dogs Never Bite under producer Cha Seung-jae, who had overseen the production of both Motel Cactus and Phantom the Submarine. The film, about a low-ranking university lecturer who abducts a neighbor's dog, was shot in the same apartment complex where Bong had lived after getting married. Although now remembered fondly, at the time of its release in February 2000 it did not stir up much interest among audiences. Response from critics was positive but slightly muted. Nonetheless, the film was invited to the competition section of Spain's prestigious San Sebastian International Film Festival, and it would go on to win awards at Slamdance and Hong Kong. Slowly building international word of mouth also helped the film financially — over two years after its local release, the film reached its financial break-even point due to sales to overseas territories. Bong's second film, Memories of Murder, a much larger-scale project, was adapted from a popular stage play centered on a real-life serial killer who terrorized a rural town in the 1980s (and was never caught). Production of the film was a long and arduous process (the film set a local record for the sheer number of locations it utilized), but with the weather providing unexpected help with some stunning skyscapes, the film wrapped without major problems. It was released in April 2003 and proved an immediate critical and popular success. Enthusiastic word of mouth drove the film to sell over five million tickets (rescuing Cha Seung-jae's production company Sidus from near-bankruptcy), and a string of local honors followed, including Best Picture, Best Director, Best Actor (for Song Kang-ho) and Best Lighting prizes at the 2003 Grand Bell Awards. Although passed over by the Cannes and Venice Film Festivals, the film eventually received its international premiere (again) at San Sebastian, where it picked up three awards including Best Director. The film also received an unusually strong critical reception on its release in foreign territories such as France and the U.S. Following this, Bong took some time to contribute short films to two omnibus projects. Influenza is a disturbing 30-minute work acted out entirely in front of real CCTV cameras stationed throughout Seoul. The film, which charts (from a distance, quite literally) a desperate man's turn to violent crime over the space of five years, was commissioned by the Jeonju International Film Festival, together with works by Japanese director Sogo Ishii and Hong Kong-based Yu Lik-wai. His films Memories of Murder, The Host, Madeo and Snowpiercer were re-released as a film series in April 2015 in the Jacob Burns Film Center in New York. Twentidentity, meanwhile, is a 20-part omnibus film made by alumni of the Korean Academy of Film Arts, on the occasion of the school's 20th anniversary. Bong's contribution is Sink & Rise, a whimsical work set alongside the Han River that can be seen as a warmup for the director's third feature. The Host marked a step up in scale in Bong's career, and indeed for the Korean film industry as a whole. The big-budget ($12 million) work centered on a fictional monster that rises up out of the Han River to wreak havoc on the people of Seoul — and on one family in particular. Featuring many of the actors who had appeared in his previous films, the film was the focus of strong audience interest even before it started shooting, but many doubts were raised about whether a Korean production could rise to the challenge of creating a full-fledged, believable digital monster. After initially contacting New Zealand's Weta Digital — the company responsible for the CGI in The Lord of the Rings— scheduling conflicts led Bong to San Francisco-based The Orphanage, who took on the majority of the effects work. After rushing to meet deadlines, the film received a rapturous premiere in the Directors' Fortnight section of the 2006 Cannes Film Festival. Although local audiences were slightly more critical of The Host than attendees at Cannes, the film was nonetheless a major summer hit. With theater owners calling for more and more prints, the film enjoyed South Korea's widest release ever (on over a third of the nation's 1800 screens) and set a new box-office record with 13 million tickets sold. The Host was quickly sold around the world, and US studio Universal snapped up remake rights. In 2008, Bong along with Michel Gondry and French director Leos Carax, directed a segment of Tokyo!, a triptych feature telling three separate tales of the city. Bong's segment is about a man who has lived for a decade as a "hikikomori" — the term used in Japan for people unable to adjust to society who don't leave their homes — and what happens when he falls in love with a pizza delivery girl. Bong's fourth feature film Mother is the story of a doting mother who struggles to save her disabled son from a murder accusation. It premiered in the Un Certain Regard section at 2009 Cannes Film Festival to much acclaim, particularly for actress Kim Hye-ja. Mother repeated its critical success locally and in the international film festival circuit. In 2011, Bong contributed to 3.11 A Sense of Home, an anthology of films, all 3 minutes 11 seconds in duration, addressing the theme of home. The films were made by 21 filmmakers in response to the devastating earthquake and tsunami which hit the Tohoku region of Japan on March 11, 2011. The film screened on the first anniversary of the disaster. In Bong's short film Iki, a teenage girl finds a toddler, seemingly dead, on a beach. That same year, Bong served as a jury member for the 27th Sundance Film Festival. He was also the head of the jury for the Caméra d'Or section of the 2011 Cannes Film Festival, and the 2013 Edinburgh International Film Festival. 2013 saw the release of Bong's first English-language film Snowpiercer, based on the graphic novel Le Transperceneige by Jean-Marc Rochette and Jacques Lob. Set largely on a futuristic train where those on board are separated according to their social status, the action adventure was met with near-universal praise and strong ticket sales, both in South Korea and abroad. As of August 2014, the film had a Rotten Tomatoes rating of 95% critical approval. In 2015, Bong's next film Okja was announced. On April 30, 2015, screenwriter Jon Ronson announced on his Twitter account that he was writing the second draft of Bong's screenplay for the film. Darius Khondji joined the film as cinematographer in February 2016. Filming for the project began in April, 2016. In 2017, Bong premiered Okja at the 2017 Cannes Film Festival, where it competed for the Palme d'Or and sparked controversy due to it being produced by Netflix. The film was met with boos, mixed with applause, during its premiere at the 2017 Cannes Film Festival, once when the Netflix logo appeared on screen and again during a technical glitch (which got the movie projected in an incorrect aspect ratio for its first seven minutes). The festival later issued an apology to the filmmakers. However, despite the studio's negative response, the film itself received a four-minute standing ovation. The film was later released on Netflix on June 28, 2017 and received positive reviews. On the film review aggregator website Rotten Tomatoes, the film has an approval rating of 84% based on 125 reviews, with a weighted average of 7.5/10. The site's critical consensus reads, "Okja sees Bong Joon-ho continuing to create defiantly eclectic entertainment – and still hitting more than enough of his narrative targets in the midst of a tricky tonal juggling act." On Metacritic, the film has a score of 76 out of 100, based on 31 critics, indicating "generally favorable reviews". New York Times critic A.O. Scott wrote, "Okja is a miracle of imagination and technique, and Okja insists, with abundant mischief and absolute sincerity, that she possesses a soul." ^ "Box Office: All Time". Korean Film Council. Retrieved 2018-03-11. ^ Gardner, Chris (2017-05-19). "Cannes: Netflix's 'Okja' Premiere Gets Four-Minute Standing Ovation After Press Screening Snafu". The Hollywood Reporter. Retrieved 2018-03-11. ^ Dietz, Jason (2017-07-19). "25 Best Film Directors of the 21st Century (So Far): Bong Joon-ho". Metacritic. Retrieved 2018-03-11. ^ a b c d e f g Paquet, Darcy (28 February 2008). "The Bong Joon Ho Page". Koreanfilm.org. Retrieved 2012-11-18. ^ "Bong Joon Ho: Writing New Chapter in Korean Film History". KBS Global. 15 November 2006. Retrieved 2012-11-18. ^ Paquet, Darcy. "Barking Dogs Never Bite". Koreanfilm.org. Retrieved 2012-10-11. ^ Meet "SNOWPIERCER" Director Bong Joon Ho at the Jacob Burns Film Center this March! ^ Sedia, Giuseppe (14 February 2008). "An Interview with Bong Joon Ho". Koreanfilm.org. Retrieved 2012-11-18. ^ Noh, Jean (23 August 2007). "Bong Joon Ho begins shoot on his part of Tokyo omnibus". Screen International. Retrieved 2012-11-18. ^ Gray, Jason (18 May 2011). "Naomi Kawase boards two short film initiatives". Screen International. Retrieved 2012-11-18. ^ Park, Soo-mee (11 January 2011). "Korean Director Bong Joins Sundance Jury". The Hollywood Reporter. Retrieved 2012-11-18. ^ Min, Ines (1 January 2011). "Bong Joon Ho joins Sundance jury". The Korea Times. Retrieved 2012-11-18. ^ "Bong Joon Ho to head Cannes debut filmmaker panel". BBC News. 8 April 2011. Retrieved 2012-11-18. ^ Tartaglione, Nancy (7 April 2011). "Bong Joon Ho to lead Cannes Camera d'Or jury". Screen International. Retrieved 2012-11-18. ^ Knegt, Peter (21 May 2013). "Bong Joon Ho To Head Edinburgh Jury". IndieWire. Retrieved 2013-06-07. ^ Kim, Young-gyo (27 May 2008). "Film adaptation of French dystopian comic to go global: Bong". Yonhap. Retrieved 2012-11-18. ^ Noh, Jean (17 July 2012). "Bong Joon-ho wraps Snow Piercer in Prague". Screen International. Retrieved 2012-11-18. ^ Schou, Solvej (29 October 2012). "Coming to America: South Korea's top directors on hitting Hollywood with English language films". Entertainment Weekly. Retrieved 2012-11-18. ^ Paquet, Darcy (30 April 2013). "What SNOWPIERCER Means to the Korean Film Industry: PART 1 - The summit of KOREAN Film's ambition". Korean Cinema Today. Retrieved 2013-06-07. ^ Bechervaise, Jason (30 April 2013). "BONG Joon-ho, Director of SNOWPIERCER: PART 2 - INTERVIEW "I wanted to make a very exciting train and sci-fi movie"". Korean Cinema Today. Retrieved 2013-06-07. ^ "Snowpiercer". Metacritic. Retrieved June 27, 2014. ^ "Box Office: July 25-August 7, 2013". Retrieved 2014-04-12. ^ Jones, Julie (8 April 2015). "Bong Joon Ho Will Film His Next Project In The U.S. And Korea". KDrama Stars. kdramastars.com. Retrieved 4 May 2015. ^ @jonronson (30 April 2015). "By the way - writing my first post-Frank screenplay. it's for the brilliant Bong Joon Ho. Well, he wrote the first draft, me the second" (Tweet). Retrieved 4 May 2015 – via Twitter. ^ Lang, Brent (May 19, 2017). "Cannes Apologizes For 'Okja' Screening Technical Glitches". Variety. Retrieved May 19, 2017. ^ Ryan, Patrick (May 19, 2017). "Cannes: Netflix's controversial 'Okja' gets booed for technical snafu". USA Today. Retrieved May 19, 2017. ^ Waxman, Sharon; Pond, Steve (May 19, 2017). "Netflix's 'Okja' Booed at First Press Screening in Cannes". The Wrap. Retrieved May 19, 2017. ^ Mumford, Gwilym (May 19, 2017). "Cannes apologises after technical problems and booing disrupts Netflix film Okja". The Guardian. Retrieved May 19, 2017. ^ Gardner, Chris (May 19, 2017). "Cannes: Netflix's 'Okja' Premiere Gets Four-Minute Standing Ovation After Press Screening Snafu". The Hollywood Reporter. Retrieved May 22, 2017. ^ "First Teaser for Bong Joon-ho's Okja, Coming to Netflix". ComingSoon.net. February 28, 2017. Retrieved February 28, 2017. ^ "Okja (2017)". Rotten Tomatoes. Retrieved July 1, 2017. ^ "Okja reviews". Metacritic. Retrieved July 1, 2017. ^ Scott, A. O. (2017-06-27). "Review: In 'Okja,' a Girl and Her Pig Take on the Food Industrial Complex". The New York Times. ISSN 0362-4331. Retrieved 2017-06-30. ^ Hong, You-kyoung (2018-01-24). "Bong Joon-ho's next film has a cast". Korea JoongAng Daily. Retrieved 2018-03-12. ^ "봉준호 필모그래피" [Bong Joon-ho Filmography]. KMDb (in Korean). Retrieved 2018-03-12. ^ "Joon-ho Bong". IMDb. Retrieved 2018-03-12. ^ Sunwoo, Carla (2007-04-25). "(백상예술대상) 영화 '타짜'-'드라마 '주몽' 대상" [(Baeksang Grand Prize) Film 'Tazza' and TV Series 'Jumong']. The Chosun Ilbo (in Korean). Retrieved 2018-03-12. ^ Kim, Cheon-hong (2014-05-29). "'My Love' stars sweep Baeksang Arts Awards". Korea JoongAng Daily. Retrieved 2018-03-12. ^ "제24회 청룡영화상" [24th Blue Dragon Film Awards]. Blue Dragon Film Awards (in Korean). Retrieved 2018-03-12. ^ Hong, Seong-yeon (2006-12-15). "'괴물' 청룡영화상 6개 부문 석권" ['The Host' Wins 6 Blue Dragon Awards]. The Hankyoreh (in Korean). Retrieved 2018-03-12. ^ Song, Gwang-ho (2009-12-03). "'마더' 청룡영화상 최우수작품상 수상" ['Mother' Wins Best Film at Blue Dragon Awards]. The Hankyoreh (in Korean). Retrieved 2018-03-12. ^ Jackson, Julie (2013-11-24). "'Wish' snags three wins at Blue Dragon Film Awards". The Korea Herald. Retrieved 2018-03-12. ^ Whittaker, Richard (2018-01-05). "Korea's Blue-Collar Heroes". The Austin Chronicle. Retrieved 2018-03-12. ^ Paquet, Darcy (2007-06-10). "Koreans make Grand gesture". Variety. Retrieved 2018-03-12. ^ "'살인의 추억' 대한민국영화대상 6관왕" ['Memories of Murder' Wins 6 Korean Film Awards]. Korea JoongAng Daily (in Korean). 2003-12-01. Retrieved 2018-03-12. ^ "'The Host' Carries Off Six Trophies at Korea Film Awards". The Chosun Ilbo. 2006-11-21. Retrieved 2018-03-12.